can you draw kakasha-meisaroku and vegeta together sleeping in bed with white sheets? Thanks! Yo. ^^ You have an awesome art style. I love it so much! So, I was wondering if you could draw my OC, Daisuke. Err... currently, I don't have any pictures of him posted, so I'll just describe him here, mmkay? That is, if you take the request an' all. Hiii!! 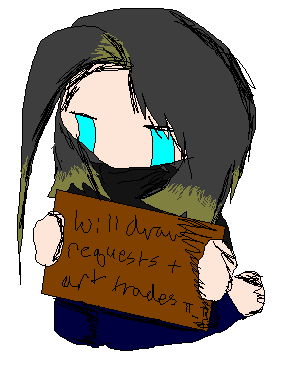 Love it hehe *favs* Ummm will you draw me my OC Kakasha-Meisaroku? Pictures of her are in my gallery!!! Thanx! hi there! your style seemspretty cool..so i was wondering if you could do a request for me since you seem to be asking for them. You do not have to accept if you do not want to. But i was wondering if you could draw me and Mike Dirnt(pic in prof.) hugging.^-^ If you need anymore descriptions then just ask me on my prof. have a nice day!